What is the relation between Arjuna of Pandavas and Bhakta Kannappa???? Actually, according to Puranas, there were 63 well-known devotees of Lord Shiva. There is a story about "Thinna(Thinnadu)". Thinna is one of the 63 devotees of Lord Shiva. This Thinna is nothing but Arjuna of Pandavas. Another birth or incarnation of Arjuna is Thinna. Once upon a time, Arjuna was performing a great penance for Lord Shiva. Shiva was pleased with Arjuna's devotion and his penance and wanted to test him. Shiva sent a wild boar(a wild pig) to disturb penance of Arjuna. 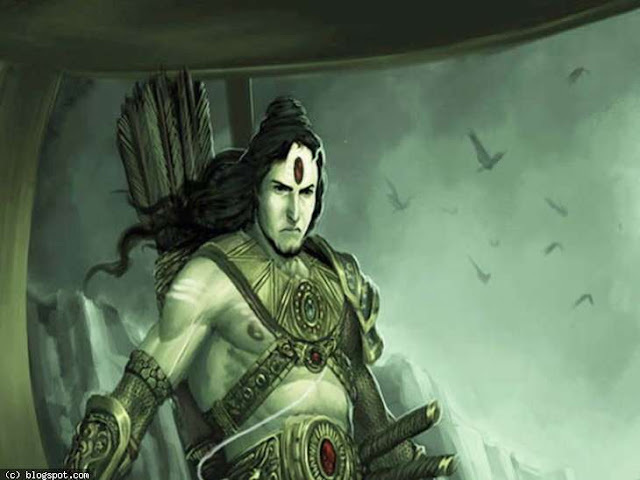 Arjuna lost patience and got angry with that boar and shot an arrow at the wild boar, at the same Lord Shiva in the form of hunter also shot the same boar with an arrow. Then there was a clash between both Shiva and Arjuna and finally, Shiva impressed with Arjuna's efforts and showed him his real form. Lord Shiva allowed Arjuna to ask two boons. a) First one is Pashupata Astra, Shiva told Arjuna that this Pashupata Astra can be allowed to use once, after that it would return to Lord Shiva. b) The second one is Moksha, Arjuna asked Shiva for Moksha in this birth itself but Shiva refused and said Moksha would not be granted in this birth because you asked weapon to kill your relatives(Kauravas) in this birth, so you have to take one more birth and to get Moksha to reach Lord Shiva. According to the second boon, Arjuna got second birth, that is none other than Thinna to NathaNatha and Tendai couple. Once Thinna was hunting in the forest near Sri Kalahasti, he founded wild boar and hunted it. Thinna roasted that wild boar. He thought he has to wash his legs before going to eat that pork(roasted meat of boar). He went on to search for water but on his way, he found one Shivling which was decorated with flowers. He thought no one has fed Shiva for a long time. So he wanted to feed Shiva with his roasted pork. Again he thought like this "will Shiva eat without bath??". So he went to the pond and brought water with his mouth because he has pork in his hands. Using his slippers he removed all the decorated flowers from Shivling. He then poured water from his mouth on Shivling and brought flowers and leaves and decorated Shivling with them. After that, he offered pork to Shiva and that was eaten by Shiva. Thinna used to do in the same way every day. "Now one doubt will come why Shiva ate the pork offered by Thinna". For this, there was one story. Once upon a time, there were demons called Sundara Sriras. They performed great penance to Shiva and asked for Moksha. Shiva told them that they will reborn as animals in this forest and when any hunter would hunt them and offered that meat to Shiva, then he would eat that meat nothing but bodies of those demons. Then they will get Moksha. That's why Shiva ate that roasted pork offered by Thinna. Coming to the original story, At the time of Thinna living, there was one brahmin living called Shivagochara. Shivagochara came to know that Shiva was offered meat and he was worshipped with water taken with mouth and removal of flowers with slippers. He thought this worship was worst and felt sad, so decided to take suicide without bearing that sadness. He started beating his head on Shivling then a voice came from Shivling and said stop doing that and hide and wait here. So he hid at the back of Shivling. After some time as usually, Thinna came with roasted pork and water in his mouth and fowler on his head and started worshipping. After he finished the decoration, he offered pork to Shiva but Shiva did not eat pork. Thinna felt sad and thought why Shiva was refusing his Naivedhya today. Then he saw at Shivling, he observed that blood is coming from one eye of Shivling. Quickly Thinna plucked his one eye and placed at the eye of Shivling where blood was coming. After that blood was coming from another eye, so Thinna was going to pluck his second eye but stopped and thought if "I could pluck another eye also then I would become completely blind and I am not able to see where to place the second eye". 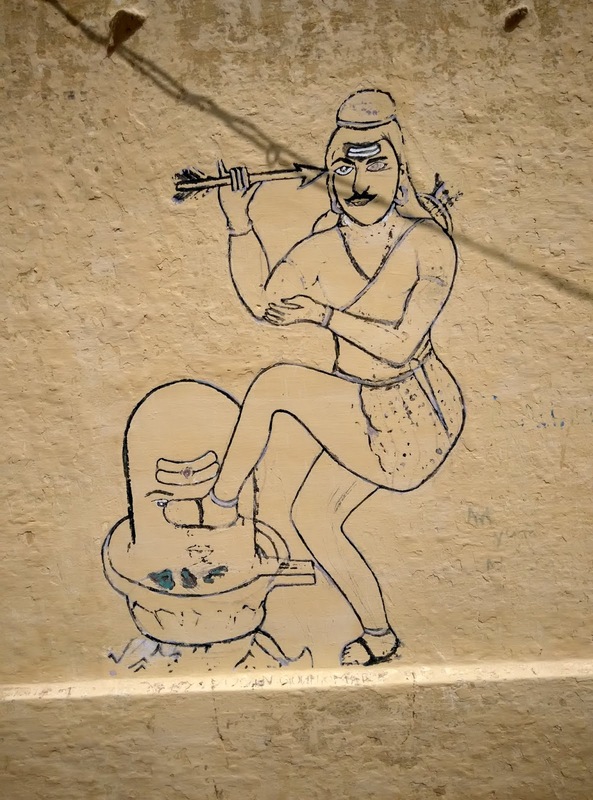 So Thinna placed his leg on the second eye of Shivling where blood was coming to know the exact placement to put the eye and started to pluck his second eye. Suddenly Shiva appeared in front of him for his great devotion and restored two eyes back to him and removed his half-blindness. Shivagochara who was seeing all this from the back side of Shivling was astonished and not able to believe the great devotion of Thinna. Then Shiva named Thinna as Kannappa. Kannappa means the person who offered his eye(Kannu) to another person. Note: In Telugu, the meaning of the eye is Kannu, Kannappa offered his Kannu so he is regarded as great Bhakta Kannappa. So finally, Arjuna is nothing but the great "Bhakta Kannappa". In this birth as Bhakta Kannappa became a great devotee of Lord Shiva and got Moksha in this birth.